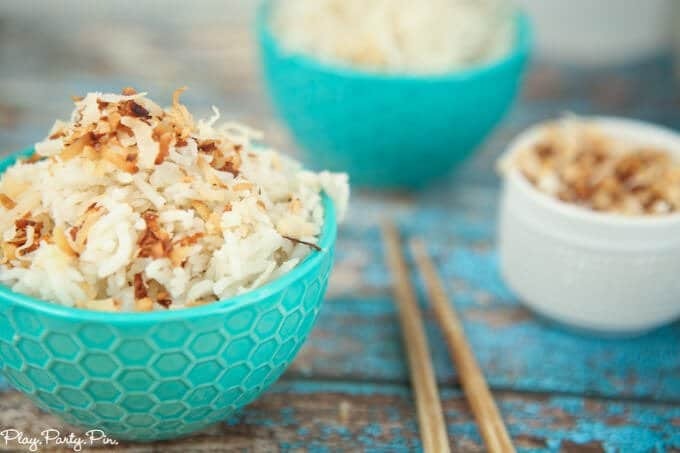 This coconut rice recipe is perfect when you’re craving Asian for dinner! It goes perfectly with sweet and sour chicken, Asian meatballs, or really anything tropical. 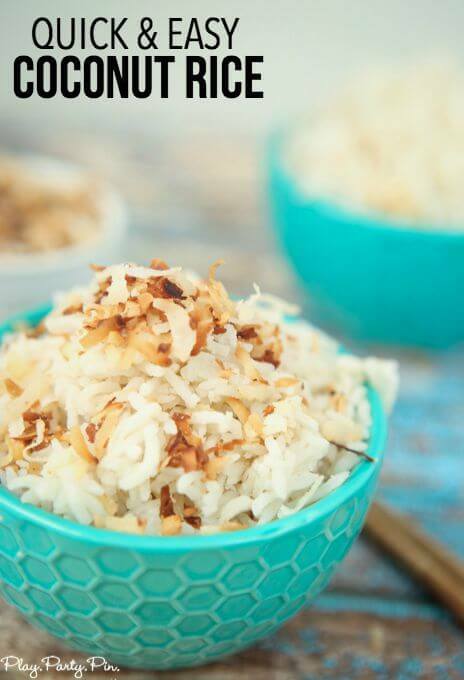 Simply cook your rice with a little coconut milk then top with sweetened coconut for a delicious side dish everyone will love! Rinse the rice in cold water until water is almost clear. Mix all ingredients other than the shredded coconut together in the rice cooker. Turn the rice cooker on and let it cook just like you would normal rice. 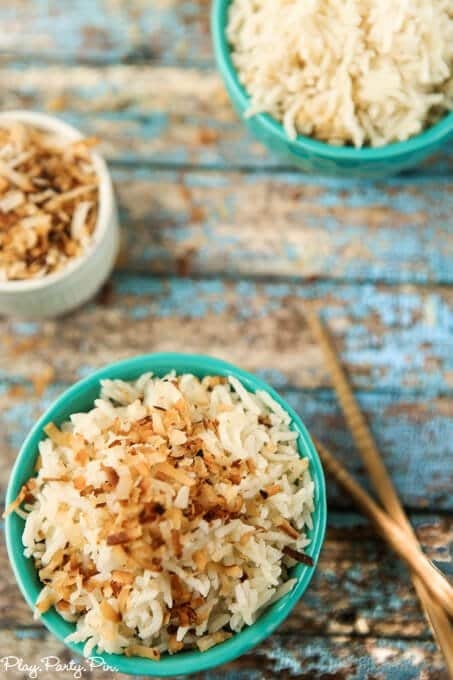 While the rice is cooking, toast the shredded coconut in a pan on the stove over medium heat until lightly browned. Make sure to watch and stir often to keep it from burning. As soon as it is browned, immediately move the coconut to another dish to keep from burning in the hot pan. Once the rice is done cooking, fluff. Serve topped with the toasted coconut. I’ll let you in on a little secret, I almost always prefer the sides of a meal to the main dish. When we went to get barbecue for dinner last week everyone else ordered meat, meat, and more meat. And I ordered a three side dish – brussels sprouts, sweet potato fries, and mac and cheese. If I could, I would really eat just sides for every meal because they are my favorite part of the meal, well other than dessert of course. This easy coconut rice recipe is probably one of my favorite sides ever and is perfect with Asian meatballs and a side of edamame or broccoli. There are some things that I just can’t do no matter how many times I try and cooking rice on the stovetop is one of them. It might have something to do with the fact that I get distracted and forget about it but every time I’ve tried cooking rice on the stove, I always end up with burnt rice on the bottom. And that my friends is why we bought a rice cooker. We make this coconut rice using our super basic (one button that you switch on to cook) rice cooker, but I’m sure you could cook it on the stovetop pretty much the same way if you don’t have a super fancy rice cooker like ours. It really is probably on my top 10 list of favorite things we eat on a regular basis. 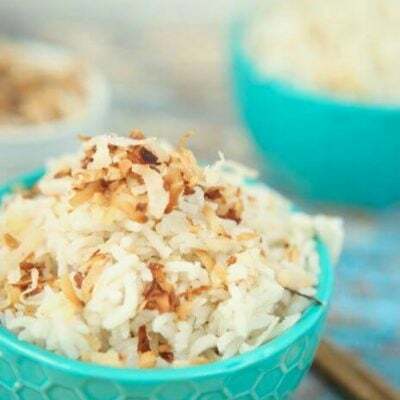 Don’t forget to pin this coconut rice recipe for later! I love my rice cooker too! When I don’t use it I’m the one who lifts the lid of the pot to see how the rice if doing, which as we all know, is absolutely not what you are supposed to do, lol! Also pinning the coconut rice because I can imagine how yummy it tastes! It looks really delicious! I pinned it so I can make me some coconut rice when I have the ingredients ready. I love coconut rice and this looks like a great recipe! Never heard of coconut rice. This looks yummy & am pinning it for later. Visiting from DBB Theresa @DearCreatives happy Monday! I LOVE coconut rice! This recipe looks super yummy. Thanks for sharing! This looks delicious! I LOVE coconut! This looks delicious. If I try it it will be without the ginger though as my boys do not seem to like it too much. Looks absolutely delicious! Pinned it…I could see pairing it with an Indian meal. Thanks Michelle, it would be great with Indian or any other Asian food. I love coconut rice and this recipe looks like what I might have done. But I have never goten round to using my rice cooker, should give it a try sometime. I hope you are enjoying your day today, happy SITS day! Sounds delish, I look forward to trying it out! Looks tasty. I’m going to have to try it. Stopping by from SITS, looks fantastic.! Kelsey you could definitely make this on a stove, just cook the rice on the stove instead of in the rice cooker. We just use the rice cooker because it’s easier but the flavors will all be the same over the stove. I am the same way! If there are sides or a veggie plate option, that’s what I am getting! This recipe looks great! I’m dying to know where you got that turquoise honeycomb bowl, though! I’m guessing World Market Sarah! This is sooo yummmm!! It’s perfect with spicy curries or meats. I am pinning this for later. It looks scrumptious!